Limes can be either sour or sweet depending on the variety; however, sweet limes are not widely available in the United States. 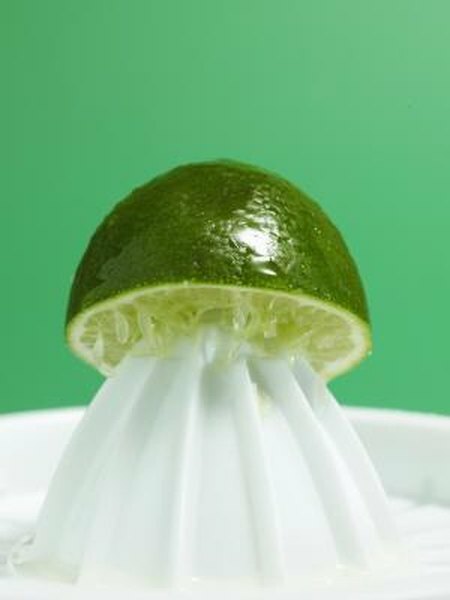 Lime juice made from sour limes, freshly squeezed or bottled, adds an acidic tart zing to beverages, seafood, meats, salads, vegetables and other food items. This fat-free flavor enhancer is an outstanding source of vitamin C, low in calories and contains compounds that may help fight cancer. Like all citrus fruits, limes and their juice are very high in vitamin C. Slightly less than 1/4 cup of lime juice, or about 50 grams, provides 15 milligrams of vitamin C -- 20 percent of the 75 milligram recommended daily value for women. Vitamin C is an antioxidant nutrient. It supports immune system function and helps protect your cells from damage caused by free radicals. According to the National Cancer Institute, free radicals are charged atoms or groups of atoms with an odd number of electrons, which can be formed when oxygen interacts with certain molecules. Once formed, they can react with important components within cells, such as DNA and cell membranes, impairing their function. A 50-gram serving of fresh lime juice contains only 15 calories and is fat and sodium free, but provides an enormous amount of flavor. In addition to turning plain water into a calorie-free, tasty thirst-quencher, you can squeeze or pour it over salads, freshly grilled fish or vegetables, shellfish and other foods in place of high-calorie, high-fat flavor enhancers. In addition to calories and fat, other flavor enhancers may be high in sodium, exacerbating high blood pressure. Because lime juice is acidic, you can also use it to tenderize lean cuts of beef, or as a diet-friendly, heart-friendly marinade ingredient. There are disease-fighting compounds found in citrus fruits, such as limes and lemons, known as limonoids. According to the U.S. Agricultural Research Service, your body can readily absorb and use a specific, long-acting limonoid called limonin. Limes and lemons contain almost as much limonin as they do vitamin C. This compound, in a culture study, published in "Nutrition and Cancer" in 2001, as well as in laboratory studies on human and animals cells, as noted in a June 2003 article in the “Journal of Agricultural and Food Chemistry,” has been shown to induce cancer cell death and may be particularly beneficial for protecting against cancers of the skin, breast, mouth, lung, colon and stomach.